Read UndEd2_ReadMe.txt for installation information. $3F = Unreal 220, only two Undying basemaps (Aeons.sac, Entry.sac) have this common Unreal version number. $44..54 = Undying Beta, some maps and packages have these numbers, most likely created from earlier Undying Beta and Demo versions, which were internally used by the devs only. $55 = Undying v1.0 Retail (Common Identifier), based on a natively modified Unreal/UT 420 Engine. For PackageVersion Numbers of other UE1-based games, see my KHG Patch Thread. Undying has the highest common PackageVersion ($55 = 85) I have encountered in UE1 thus far, followed by DS9 ($49 = 73) and both UT'99 and Rune ($45 = 69), all based on the Unreal Tournament Engine (1999) and therefore the most technically advanced in the UE1 pool of games that were created back in the days. And after replaying and technically reviewing Undying recently I have to say that Undying truly runs on the most advanced UnrealEngine1, since these days I can put this in comparison much better than 14 years ago when Undying first came out and I only had a few UE1-based games in my collection. The development team (Electronic Arts) have implemented some really unique and awesome technical features into the original UE1. Most of these features are natively hardcoded in Undying's DLL libraries, the rest can be found in Undying's UnrealScript .u class packages. 1. Undying's Particle System, showcased in the demo map CBU_Particles.sac and included in my UndEd2 pack. It is much easier to create dripping blood, flowing water and rain drops, falling snow, nice-looking trails from magic spell weapons and other types of dynamic particles in Undying than doing so in any other UE1-based game. 2. Undying's Parallel Universe (past and present) in real-time, like the invisible monks in the Monastery Ruins which you can only see when you use your magic stone, or like the normal paintings on the wall in the Manor which turn into horrific images when you use the spell to see them. 3. Zoned Music and Ambient Sound! YES, Undying is the only UE1-based game in which you can assign ambient music and sound effects to specific zones only without the sound being heard behind walls, doors or even windows, providing that you properly encapsuled the zone with ZoneBrushes (Sheets) in UnrealEd. If you ever played Monolith's F.E.A.R. (First Encounter Assault Recon) FPS Series then you know how immersive zoned music and ambient sound can be, especially in a Horror FPS game. 4. Zoned Weather! Undying has a new actor class called ZoneWeather or WeatherZone. It works like Zoned Ambient Sound. You can assign different weather to different areas on the same map. For instance, rain outside and normal "weather" in interiors. 5. Invisible floor tiles which magically appear when you step on them and disappear when you walk on! Mostly found in the Oneiros demon worlds. No, this Undying effect is not made with some fancy Mover Brushes or accomplished by some skilled UnrealScript. It is really a special Brush type in UnrealEd which was natively hardcoded and added exclusively to Undying's engine. 6. Compressed Undying Maps!! (*.sac). Not sure what type of compression algorithm is being used here. Probably LZMA/PKZIP (ZIP) or some custom algo. However, UndEd2 compresses Undying maps down to such a small filesize that even ZIP and RAR can't pack it down any further. So it must be really good! Much better than baked/cooked packages in UT3. In other words, Undying already used compressed game packages years before Unreal Tournament 3 (UE3) introduced them. And the compression ratio is higher! So that's some real magic there. There are other minor technical features in Undying too which are worth exploring as a modder and mapper. In order to edit and recompile user-made mods (*.u) for Undying, extract everything with UCC rather than UndEd2. Make sure that the resource directories exist and are properly named or UCC won't export any files. You should create all these subdirectories in your ..\Undying\ root folder in order to recompile the classes and resources with UCC later on. Undying does not use .3d, .psa, .psk formats but its own mesh format called NeutralGeometryFile (NGF.dll, *.ngf) where all the Unreal mesh data is stored in one single file! 1. You won't be able to create and import your own mesh models into Undying unfortunately, unless you have some sort of NGF plugin for 3D Studio which can save *.ngf format files. I haven't found such a plugin yet. 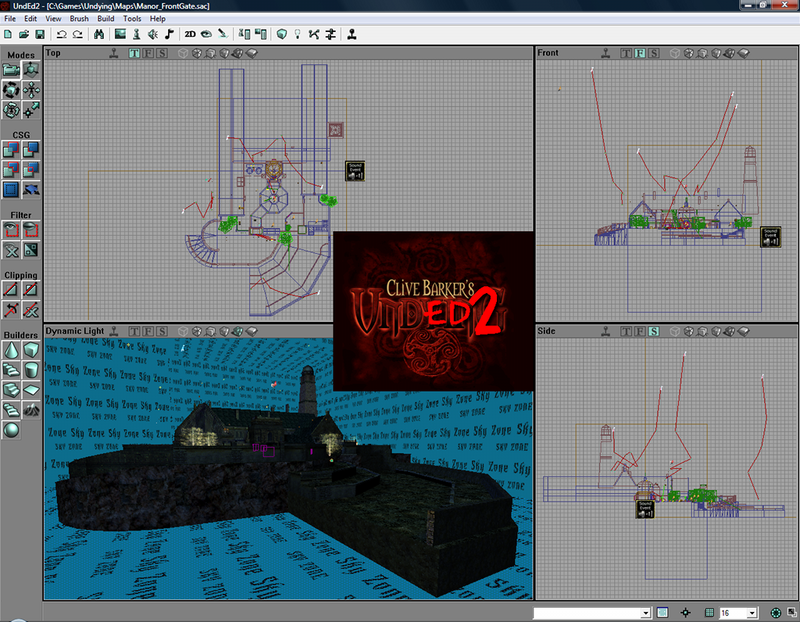 You could try Undying's NGF.dll system library as a plugin in your 3D editing software and see if it works, however. 2. You won't be able to fully recompile two of Undying's system packages (Aeons, Cutscenes), simply because you can't fully export all the resources, in particular the NGF model meshes. UCC gives the following critical error and exits the application after encountering the first mesh file in the *.u packages. It is strange that Undying's UCC does not come with a NGF Exporter for the meshes. The NGF.dll library probably only includes an Import/Read function for *.ngf files but no Export/Save function. Whatever. You can however export and recompile all Classes, Sounds and Textures from Undying's system packages. But when you release a mod you need to use different names for your .u packages. It will also include some new stuff for Undying and some tweaks to make the game better! And ofcourse I like to release a map pack too with HD textures! Might or might not be helpful. Mate, how do I change the render mode to D3D? The render modes aren't visible at all in the viewport options.